Sea chanteys, ballads, and original songs about water. Lilting vocal harmonies, hammered dulcimer, piano, guitar, and concertina. And trickling gently through it all, music directly from the water: notes and chords composed and played entirely by fish! Three humans and two goldfish perform together in a truly astonishing musical partnership. Our material and style flow from folk genres: sea chanteys, ballads, and original songs about water and the creatures that swim in it, fly over it, or sail upon it. Lilting vocal harmonies gracefully weave with hammered dulcimer, piano, guitar, and concertina. And trickling gently through it all, music directly from the water: notes and chords composed and played entirely by fish as they listened to our human performers. Through an amazing marriage of art and technology, our musical fish comprise an aquatic orchestra, playing a diverse collection of virtual instruments from electric guitar to jazz bass to orchestral harp. 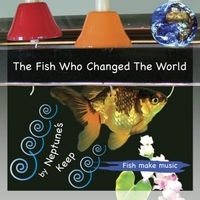 This unprecedented collaboration between human and fish redefines musical beauty! Animal Planet TV, BBC Radio, Ripley's Believe It Or Not, and newspapers worldwide have featured our performing fish. Fish have hidden depths!